BUFFALO, N.Y. (AP) Booed off the ice after 40 minutes, Jack Eichel and the Buffalo Sabres gave their fans something big to cheer about 1:05 into overtime against the San Jose Sharks on Tuesday night. That’s how much time had run off the clock when Eichel set up Evander Kane to pull out a 5-4 victory in which Buffalo overcame a three-goal deficit in the third period. And it’s not as if Eichel took exception to the booing. ”Ummm, we didn’t play well for two periods,” he said. Try, nearly 2 1/2 periods. After trailing 4-1, the Sabres scored three times in a span of 3:28 to stun the Pacific Division leaders and force overtime. Eichel sparked the surge by setting up Ryan O’Reilly’s one-timer in the slot for a power-play goal with 10:57 left. Kane scored on a wraparound 2:33 later, and Kyle Okposo one-timed in Sam Reinhart’s centering pass to tie the game with 7:29 left in regulation. Eichel then capped the run by setting up Kane’s decisive goal. Driving up the right wing on a 2-on-1, Eichel slipped a pass through the middle that Kane snapped in before falling headfirst into the end boards. Sharks coach Peter DeBoer had difficulty putting his team’s collapse in context. Though this wasn’t the Super Bowl, DeBoer could sympathize with how the Atlanta Falcons felt after squandering a 28-3 lead in a 34-28 overtime loss to New England on Sunday. The Sharks did earn a point, and are 8-1-2 over their past 11 games. The Sabres rallied from a three-goal deficit to win for the first time since a 4-3 shootout victory over the New York Islanders on Dec. 27, 2014. Buffalo had not won when trailing by three with under 12 minutes left since a 5-4 shootout win at Boston on Nov. 2, 2006, according to the Elias Sports Bureau. That it happened against the Sharks was only fitting. Buffalo improved to 17-1-1 at home against San Jose, with its only regulation loss a 5-0 decision on Dec. 2, 2005, in Joe Thornton’s debut with the Sharks. The Sabres also improved to 10-0-1 in the past 11 meetings since a 5-2 loss at San Jose on Jan. 23, 2010. 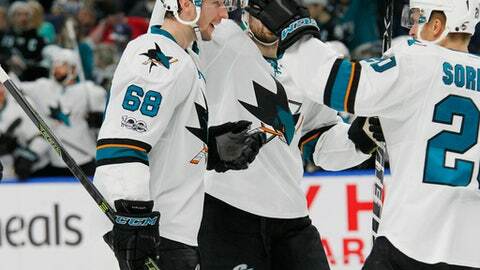 Joel Ward, Logan Couture, Joe Pavelski and Melker Karlsson scored for the Sharks. Brent Burns had two assists. Martin Jones made 31 saves for San Jose, while Buffalo’s Anders Nilsson finished with 36. The Sharks appeared to have the game in hand when Pavelski one-timed in Burns’ pass on a power play to make it 4-1 at 6:07 of the third period. San Jose had a four-game road winning streak snapped and dropped to 22-2-2 when leading after two periods. The Sharks had two calls go against them. Ward had a goal waved off in the first period when referee Marc Joannette ruled he was in process of blowing the whistle before the puck entered the net during a scramble in front. Kane’s first goal was allowed to stand when replays were inconclusive in determining whether Buffalo’s Tyler Ennis was offside in gaining the Sharks zone. NOTES: Burns extended his road point streak to 14 games, in which the star defenseman has 23 points (10 goals, 13 assists). Burns did have his goal streak snapped at eight road games. … Buffalo extended its home point streak to 6-0-1, marking the team’s best streak since going 7-0-2 from Feb. 17 to March 24, 2012. … Patrick Marleau had an assist on Pavelski’s goal to extend his point streak to seven games (seven goals, four assists). Sharks: Continue their four-game road trip at Boston on Thursday night. Sabres: Host the Anaheim Ducks on Thursday night.